!! 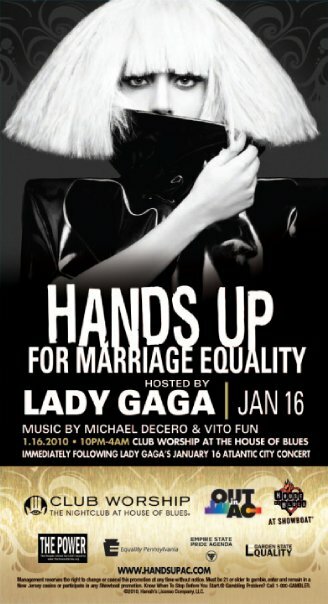 OMG, Lady Gaga’s Weekend Plans Revealed !! We reported a rumor on Wednesday that Lady Gaga might possibly be making an appearance either this weekend or next at Club 57 in NYC. While I suppose it’s still possible that she could be showing up in NY next weekend, we’ve been set straight as to her plans for tomorrow: she’ll be performing in Atlantic City and then heading over to a party for Marriage Equality at Club Worship. I really wanted to hate Lady Gaga when she first appeared, BUT WHY? I love her so much now that I can’t even remember what was wrong with her in the first place. If you’ll be in Atlantic City this weekend, here are the details for the party. 6 Comments on "OMG, Lady Gaga’s Weekend Plans Revealed"
She had not yet shamelessly pandered to your neurotic obsession with your sexuality. I heard that she collapsed from dehydration. The AC concert was cancelled…. for “exhaustion”…. Worse yet the borgata ticket holders are ONLY going to get refunds, she’s not going to reschedule the event. NOT COOL GAGA! NOT COOL. Will she explain why she stood up fans in Indiana on Thursday??? ?